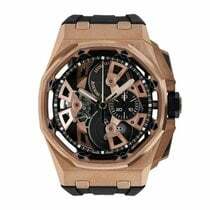 Audemars Piguet Royal Oak Offshore "Tour Auto 2009" (ref. 26278IK.GG.D002CA.01), featuring the AP Caliber 2326/2840 mechanical automatic movement with an approximate power reserve of 38-hours when fully wound; black dial with a "Mega-Tapisserie" pattern and red subdials; chronograph function with 30-minute counter at 9 o'clock and 12-hour counter at 6 o'clock; small seconds subdial at 12 o'clock; date aperture at 3 o'clock; and 42mm, brushed titanium case with a black rubber bezel on a black rubber strap with a titanium folding clasp. Case, dial and movement signed Audemars Piguet.